Jaipur, 11 December: The concluding day of the 4th edition of Jaipur Art Summit saw a multitude of visitors admiring the unique art works and installations placed there. Some of the popular ones include the Corporate Ladder, Kathakali Konnection Throne Chair, India’s biggest Circle Canvas Painting, Pie Taan. Paper Fabric Installation, among others. 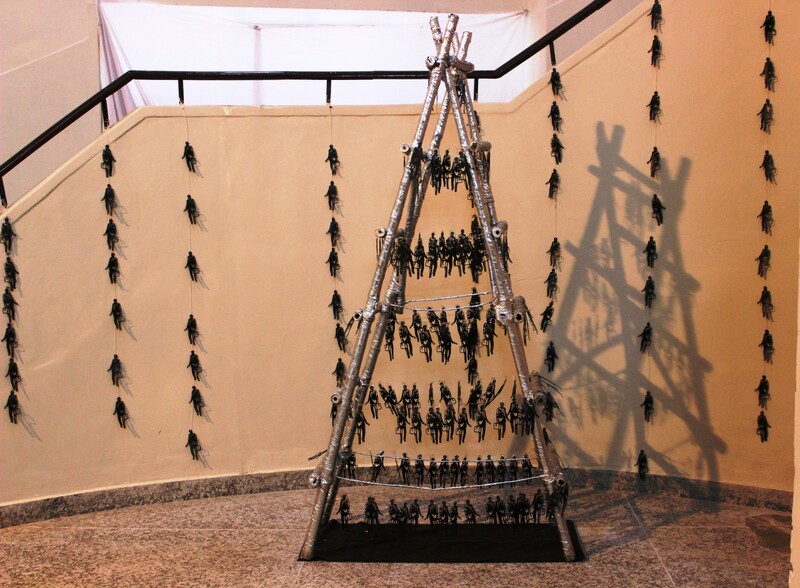 The ‘Corporate Ladder’ (by Artist Nitasha Jaini) is an installation made out of bamboo, silver gota paper cut outs and nylon thread. It reflects the culture of competition and consumerism in present times. The installation shows that how the urban male is not a wholesome centered person but rather a maniac whose entire life is focused on work and the rat race to reach and stay on top. Installation artist and interior lifestyle designer Kanika Bawa’s two art installations are indeed a crowd puller at the event – Pie Taan and Paper Fabric. As an ode to the age old craft of traditional Indian footwear and with an aim to revive this dying industry, Bawa gives an interesting twist to the Kolhapuri chappals in her installations of 8 ft 6 inches and 10 ft 6 inches. Resurrecting the classical dance form of Kathakali to its true glory, Bawa has also made a giant Kathakali chair towering above 10 ft 6 inches which is also displayed at the mega art summit. This tallest sitable art chair showcases the chair furniture as an Art Canvas – its body coloured with patterns in digital art. Inspired by the growing threat to Kathakali dance, the lessening number of ‘ghungroos’ in the installation depicts the slow and steady exit of one of India’s most revered traditional dance forms. Both the art works of Bawa are included in the Limca Book of Records. The ‘Paper Fabric’ installation is an expression of hope and growth that stitches together the parchment of future allies. The material is a manifestation of fabric intertwined with newspaper that resembles growth in a tangible structure. It is worth noting that paper is the third largest industrial polluter globally and it contributes to 25% of landfill waste. The artist duo – Neerja and Spriha – has tried to redefine the characteristics of surplus waste paper by increasing the lifespan of paper through traditional techniques. A popular spot for selfies at the summit is ‘The Blue Elephant’ by Sharad Bhardwaj. This painting is the largest circular canvas painting (diameter 4.75 m and 15.6 ft) and is also a Limca Book of Record.